PRICE INCLUDES FREE TARP! (over $300 value!!) 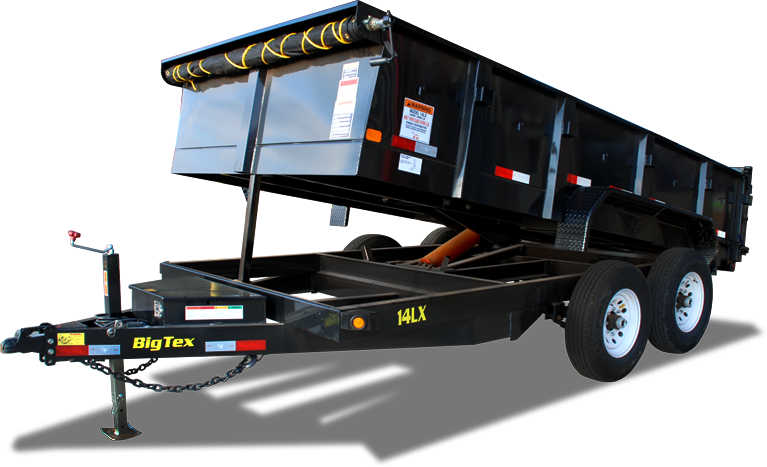 Big Tex 14LX Dump Trailers are our number one selling trailer!! We stock these in 14' & 16', with and without the front hydraulic jack, and with 4' HD high sides!! This is a work horse trailer!! Watch out for other dealers as they upsell you for items that come standard with East Coast Autos and Trailers like rear 7' slide-in ramps, TARP, SCISSOR LIFT, 110V charging system, radial tires, Dexter NEVR-Adjust brakes (number one brake in the industry! ), SPARE TIRE, spreader gate, shovel pan under the bed (for your tools!! ), and more!! These come with cambered Dexter EZ Lube axles as well to help the trailer to squat when you load your equipment in the rear for an easier load! *We have multiple trailer manufacturers and parts manufacturers that we represent. Due to the increasing tariffs on imported steel, each manufacturer of trailers and parts has begun to raise their prices. We have tried to absorb as much as we possibly could without increasing our prices but this process has been going on since January 1st. There has been price increases across the board and we have been forced to increase our prices as well. This is ONLY due to price increases that have been handed down to us.